What a difference a day can make. Yesterday was a beautiful, warm fall day and then today was a cold, wet fall day. I think the temperature dropped 30 degrees overnight. But, regardless of the weather, Erin and Rafe’s love for each other was as hot as ever as they celebrated their wedding on Saturday, November 4th, at Keswick Vineyards. 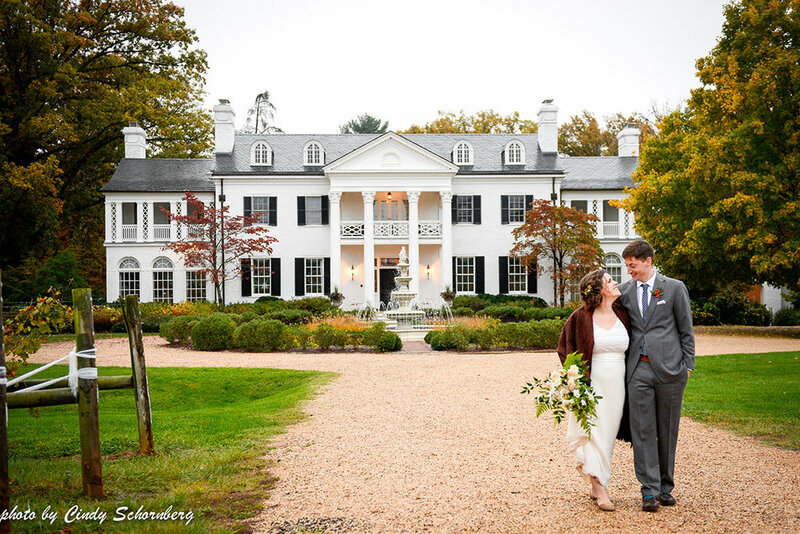 Erin and Rafe chose to do a first look which I highly recommend for our fall couples. With it getting dark outside much earlier, it is nice to get some of the photos out of the way while there is plenty of daylight. Both Erin and Rafe and the rest of their wedding party were such good sports dealing with the drizzle throughout the day. For a moment, we even thought we might get a break and be able to have the ceremony outside until I took one more look at the radar. No such luck. Radar was showing that the sky would be opening up right at ceremony time and it sure did. Thankfully everyone was under the tent and we just went with our rain plan for their ceremony. Unlike the rain plan we had to do the previous weekend in which we divided the tent with one side for ceremony and the other for the reception, this wedding we did the ceremony at the top of the dance floor. The best way to describe this rain plan is that it is like a play yet the lights don’t go down. We have our props ready to go and just move items like chairs and tables as needed as we move from ceremony to cocktail hour to reception. It is always a relief at the end of the night to hear from the couple that despite the rain they had such a great time and their guests said it was the best wedding and the most beautiful wedding they had ever been to! Wedding Planner: Dickie Morris with Just a Little Ditty, Catering: C&O Restaurant, DJ: Derek Tobler, Photographer: Kristen Finn, Hair: Brianna Adams, Make-up: Rouge 9, Florals: Chris De Jong, Transportation: Charlottesville City School buses, Rentals: Skyline Tent Company, Desserts: Rachel De Jong, Officiant: Ted Munter.